The number of people – including very young children – poisoned by swallowing e-cigarette liquids containing nicotine rose sharply in the UK last year. There were 139 calls by health professionals seeking expert advice on how to treat members of the public as the vaping habit rapidly spread. The figures obtained by the Guardian from the National Poisons Information Service(NPIS) show that there were 29 such cases in 2012 and 36 over the five years before that. The NPIS’s research indicated that over a third (36.5%) of calls involved very young children, 56% over 18s and the rest children of five and over and teenagers. Most poisoning cases were accidental and symptoms, including vomiting, nausea, dizziness and abdominal pain, were usually short-lived, according to the service’s director John Thompson. “While any cases of poisoning are of concern, our previous research showed that fortunately fewer than one-in-ten of patients developed symptoms of toxicity which lasted more than four hours and only two patients had long lasting symptoms. “However, just over a third of the telephone enquiries concerned children aged four and younger and of these, 10% developed symptoms which needed hospital care,” said Thompson. 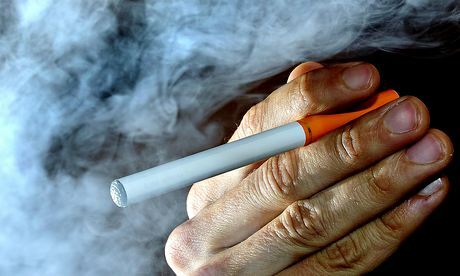 The figures obtained by the Guardian come after health warnings from the US Centers for Disease Control (CDC) which has seen big increases in calls to poison centres involving e-cigarettes – from one a month in September 2010 to 215 in February this year. Unlike the British figures, these included calls from the public as well as health professionals, and also covered cases of inhalation and absorption through the skin and eyes. Sweden too has reported increases in e-cigarette poisoning. The NPIS figures come as EU countries prepare to tighten controls over e-cigarettes and some companies opt to seek costly licensing as medicines, which they would need to back up any claim they help tobacco smokers to quit. The Welsh government is considering whether e-cigarettes should be banned from public places, and a new law banning sales to under-18s in England and Wales is expected to be implemented soon. The first e-cigarettes in the UK went on sale in 2005 and now are used by at least 2m people, according to Katherine Devlin, of the Electronic Cigarette Industry Trade Association(Ecita), a UK body with 26 companies in membership. She said the existing EU regulations covering the safety of products and chemicals should reassure the public. Manufacturers were already meant to warn e-cigarette users that liquids in e-cigarette cartridges could be toxic if swallowed or in contact with the skin and urge them to keep them locked up and out of reach of children. But trading standards officers were not always enforcing the rules, leaving room for “cowboys” to exploit consumers, Devlin said. Manufacturers and retailers operating illegally and not providing appropriate childproof packaging and labelling should be pursued by authorities although she recognised council trading standards officers had suffered public spending cuts. “We need access to these products but they need to be safe, properly tested and properly sold,” said Devlin. Ecita says the new rules will mean many e-cigarettes currently on the market will be banned and make new types less attractive and harder to use. They are expected to be detailed in a directive next month and will be phased in from 2016. These will require more information on nicotine content, including its toxicity and addictiveness, new controls over liquid refills, powers for member states and Brussels to act where there are “justified safety concerns”, and better monitoring of growing e-cigarette market.